A reading from St Luke’s Gospel tells the story of the Transfiguration. Jesus went up a mountain to pray, with Peter, James and John. As Jesus prayed, ‘the appearance of his countenance was altered and his raiment became dazzling white’. Moses and Elijah appeared in glory, talking with him. Peter wanted to build booths to mark where Jesus, Moses and Elijah had been. A cloud appeared, enveloped the disciples, and a voice was heard saying ‘This is my Son, my chosen: listen to him’. The cloud lifted and Jesus was alone. The disciples told no one about what they had seen, at that time. 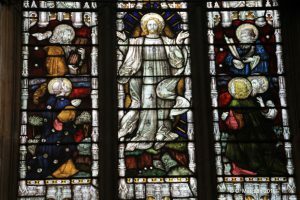 This story is depicted twice in St Swithun’s church, in the clerestory windows on the north side, and in a window on the north wall. High up on the left hand side as you face the altar, there are 5 round windows. 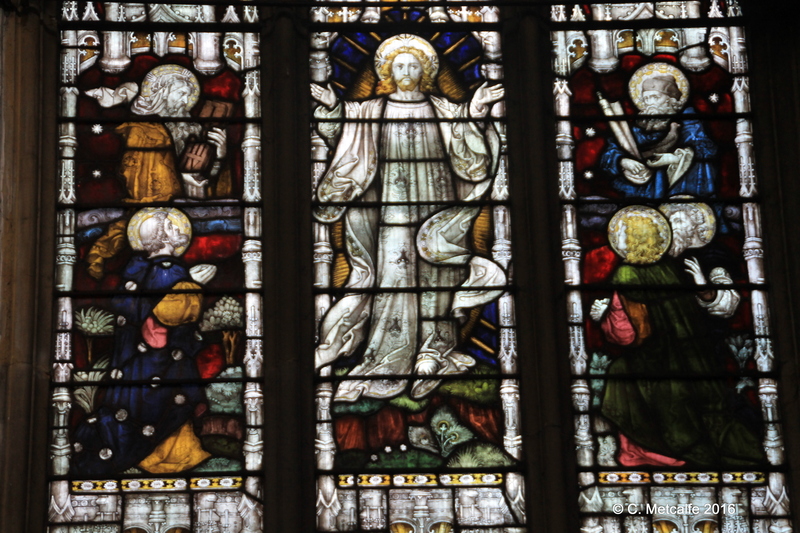 The middle one is called The Transfiguration. Jesus is the central figure. I take it to be Moses on the left, with the tablets, and Elijah on the right. Both figures have coloured haloes. The panes surrounding the central picture have beautiful decoration and bright colours. These five windows were presented in the late nineteenth century, but the central scenes seem to have been installed in 1946. 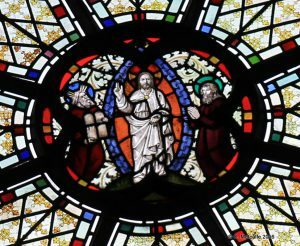 The window on the north wall, inside the side chapel, represents the Transfiguration in the upper part. The radiant figure of Jesus is in the central panel, with two higher figures and three lower figures. 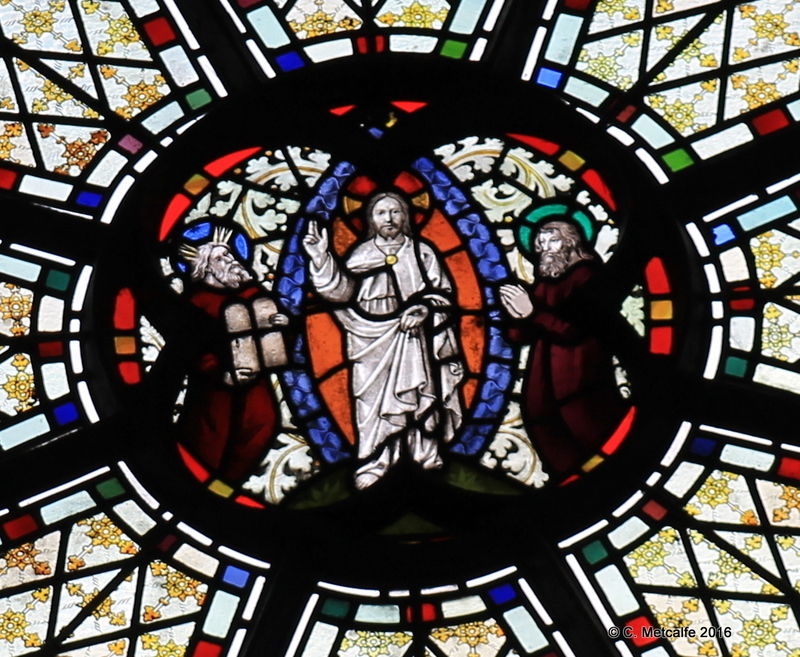 The higher figures represent Moses and Elijah, the lower three St Peter, St James and St John. This window is often harder to see because this side of the church is darker. It is worth having a good look however, as there are some exquisite flowers within the glass pictures. This window, made by Messrs Clayton and Bell in 1883, was given ‘In memory of a beloved son and brother, Richard Theodore Buckley, ‘who died August 17th 1882, aged 17 ½ years’. One of the painted organ pipes has his face and name on it, painted by the Rev’d Douglas Blakiston, who was Vicar here from 1871 until 1908.